Despite being of the heretical Shi'a Faith, the armies of the Fatimids were far more traditional to those of the Abbasids, Umayyads and Rashidun Caliphates than any of their contemporary rivals. A majority of the army (Estimated to be 60%) were infantry arrayed by national origin, fighting as a shield wall with spearmen in front with javelinmen and archers supporting from the rear. Either the entire line would advance in the attack, or sections supported by cavalry would./n/nThus it was not the twin monarchs of tribal horse archer and iron-disciplined Ghulam which were the sentinels of the Fatimids on the field of battle. The sword and scepter by which the Shi'ite Caliphate held its dominion was with it's infantry, mostly sword, javelin, and spear wielding Sudanese Slave Warriors, and its cavalry, premier amongst them the Ajnad. 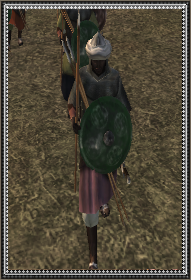 Though the Ajnad were the most prestigious of the Fatimid's military, it was their Sudanese infantry which were the backbone from which victory or defeat would be wrought. Of free-men, mercenaries and numerous slave-warriors, theirs was a legacy of deep-seated loyalty and discipline to the Fatimid Caliphate; a bittersweet virtue that came to cause much of their annihilation with the conquests of Saladin./n/nWhile the Professional Core of the Fatimid Infantry was the Abid Al-Shira, they made great use of large contingents of Sudanese mercenaries. Their ranks were drawn from the whole of East Africa, known as "Zanj" or land of the blacks by the Arabs. Abyssinians, Somalis, Makurians, Nubians, and numerous others swell their ranks, practitioners of the creeds of Muhammad, Moses, Jesus, and numerous animist spirits. Some amongst them possess discipline, while others are fierce untrained tribesmen. Dressed in simple mail hauberks, wielding circular iron shield and slightly curved single-edged swords, they too harken to the traditions of Islamic swordsmen as capable on the defense in the united shield wall as on the offense as individual martial warriors.